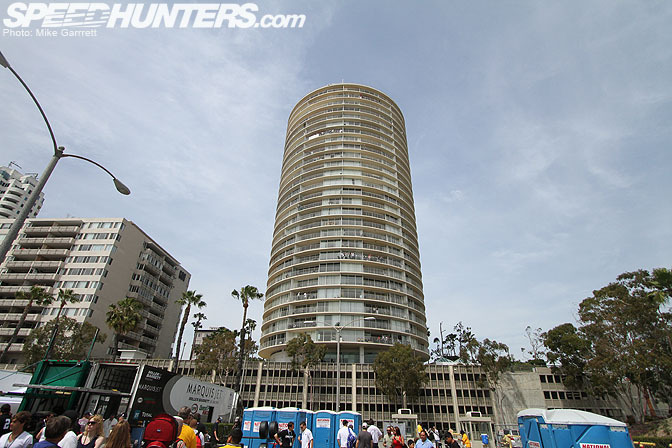 Another weekend, and another big event on the streets of Long Beach. 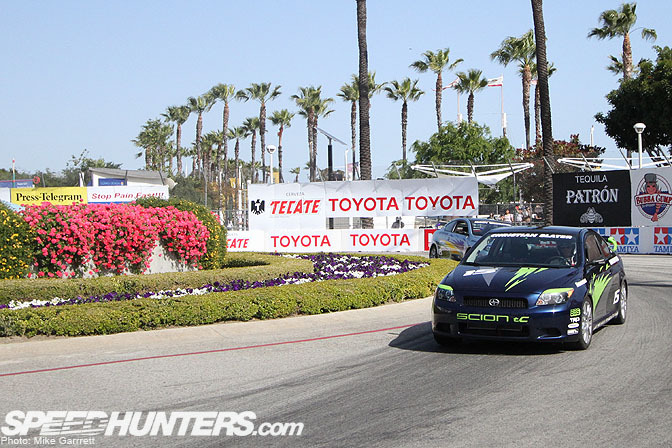 There's really nothing on earth like a street course, and for the 36th straight year the streets of Long Beach were transformed into one of the world's most famous race tracks. 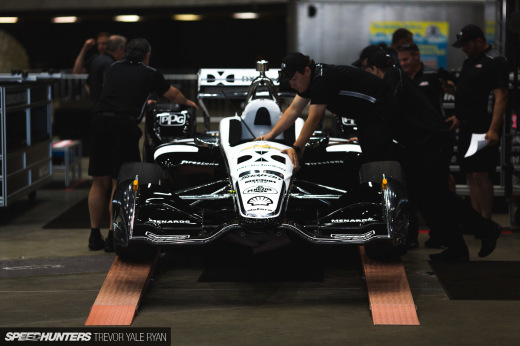 While the Indy Car series might be the biggest draw of the Grand Prix weekend, it wasn't the open-wheel action that attracted us. 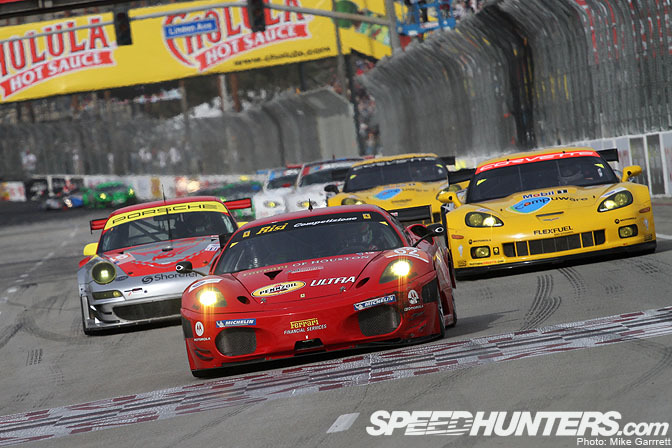 Nope, we there for the sports cars – the second race of the 2010 of the American LeMans season especially. 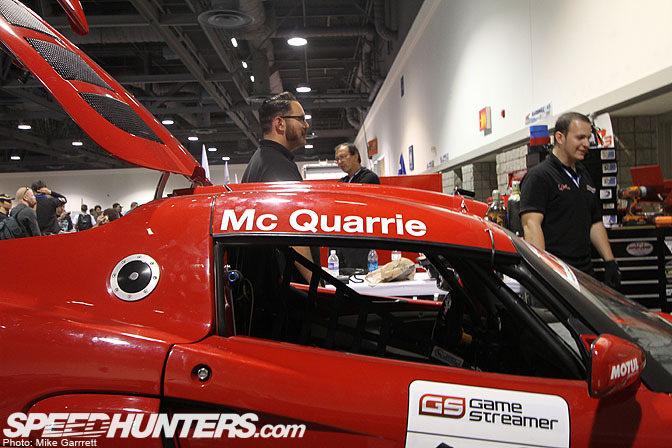 …which happened to feature Formula Drift driver Tyler McQuarrie driving a Lotus Exige. 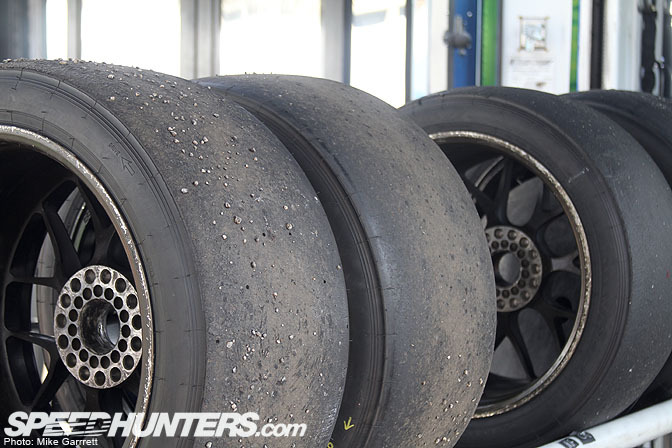 Tyler will be contributing a Driver Blog chronicling his experience in the race. place takes on a completely different personality for the Grand Prix. 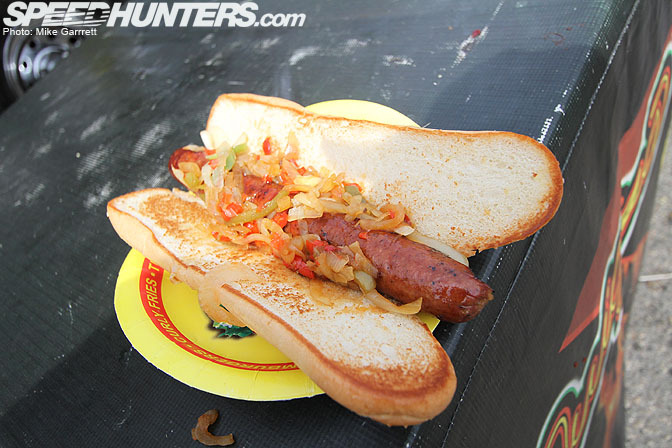 …to that wonderful race track food. Yes it's way overpriced, but that does look pretty good doesn't it? 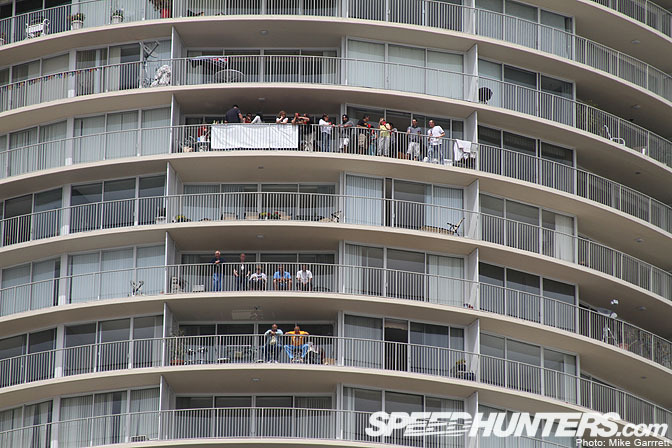 I can't be the only one who wonders what it'd be like to see the action from one of the high rise apartment buildings that line the track. These folks seemed to be enjoying it quite a bit. Now for a few action shots. 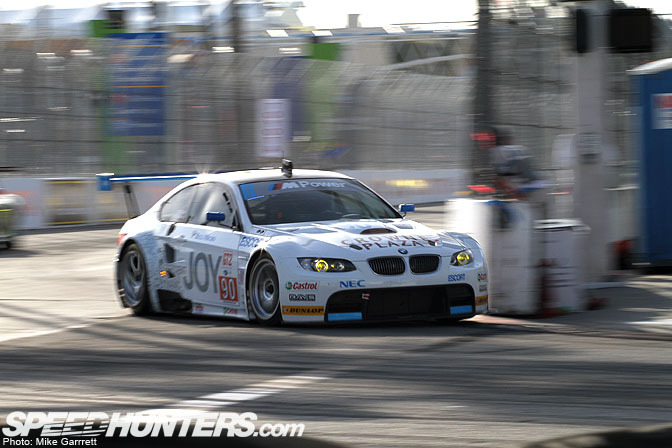 Here's the #90 Rahal Letterman M3 GT2 rounding turn six during qualifying on Friday evening. 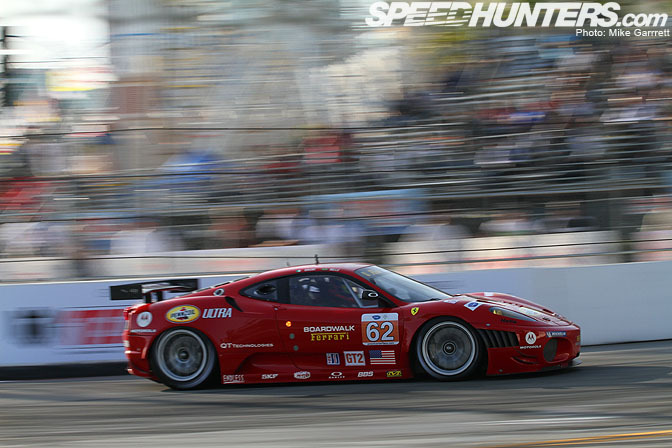 The Risi Competizione Ferrari 430 would take the pole position in the GT Class. 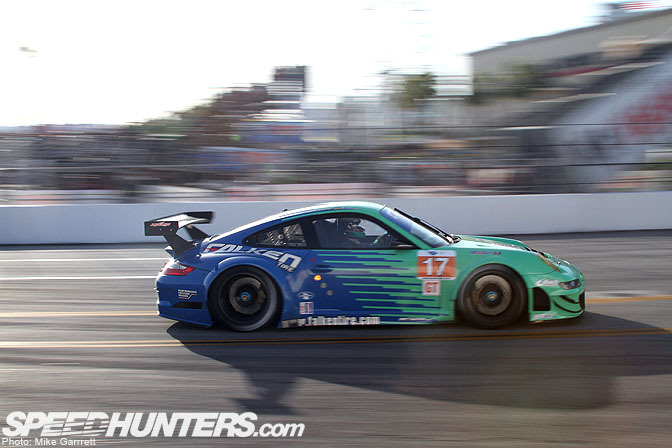 With the Falken Porsche following right behind. 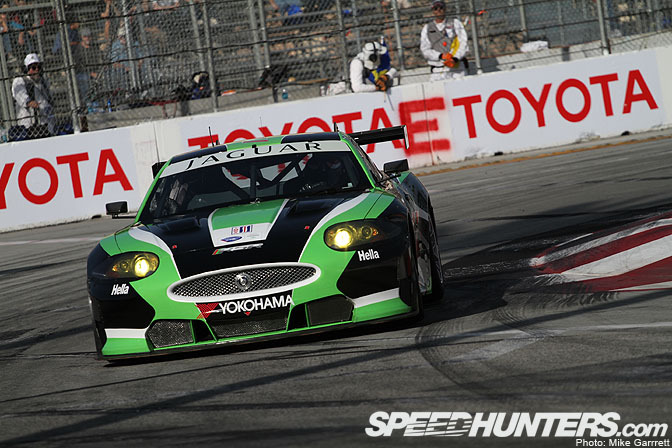 The GT2 Jaguar XKR rounds turn one during its first ever Long Beach race. Love this car. 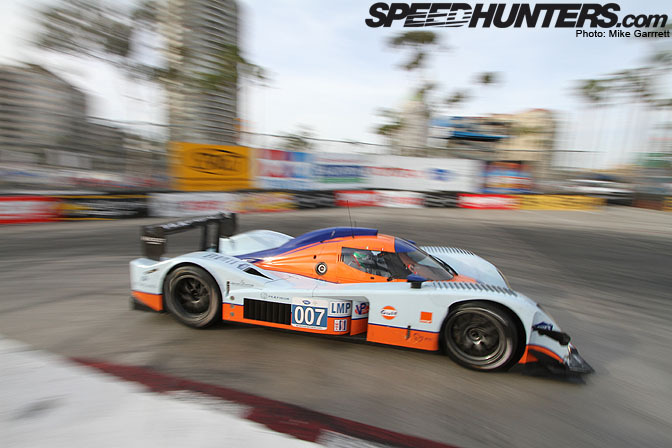 Saturday afternoon and the green flag drops on the the 100-minute sprint race, with the Gulf-colored Aston Martin LMP1 in the overall pole position. 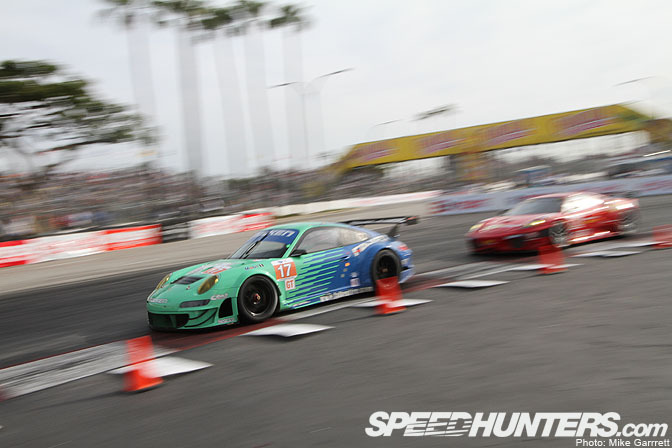 In the opening moments of the race the Falken Porsche got in front of the Risi Ferrari, and the two cars dug in for a tight battle at the front of the GT2 field. 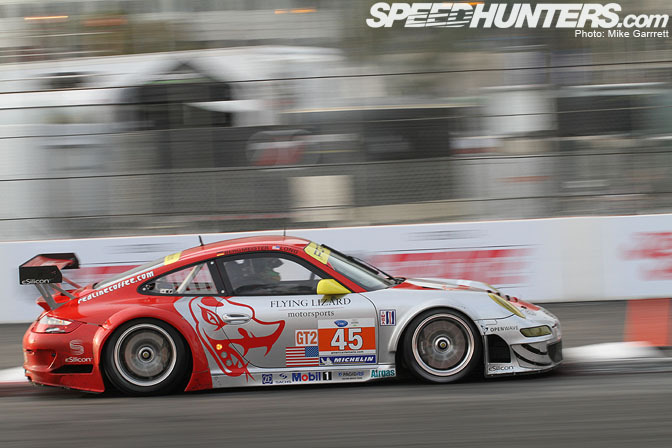 A lot can happen in 100 minutes of racing though, and at the end it'd be the Flying Lizard Porsche of Patrick Long and Joerg Bergmeister that took the GT2 victory. 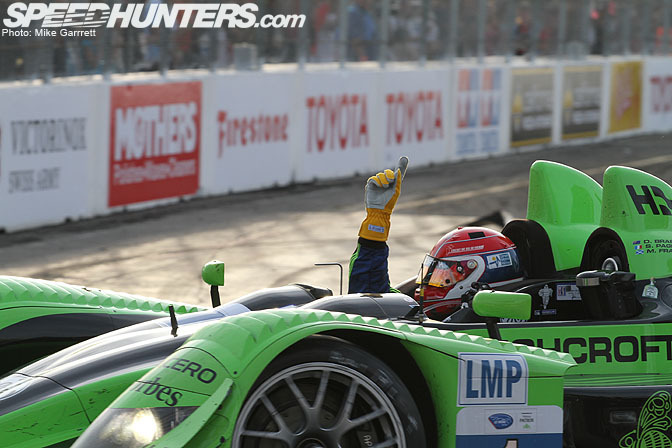 While the ARX-01-c of Simon Pagenaud and David Brabham came out on top of the LMP class. Mr. Pagenaud soaks up the moment of victory before heading to the podium. 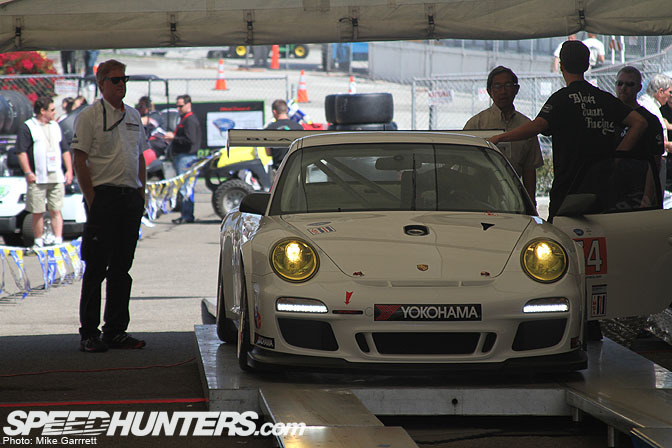 We have much more on the way way from the famous Long Beach street circuit, so stay tuned! Wallpaper on the last shot please!!! That was an amazing race...there was so much going on you had to really pay attention. 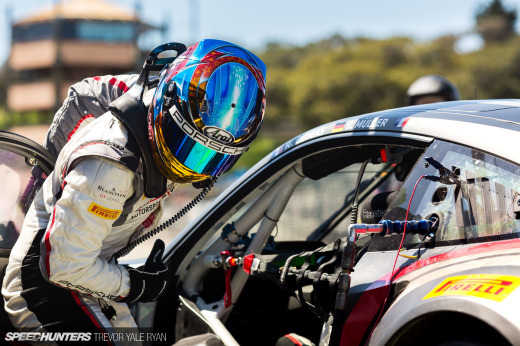 Congrats to the Flying Lizard team and the Patron Acura. 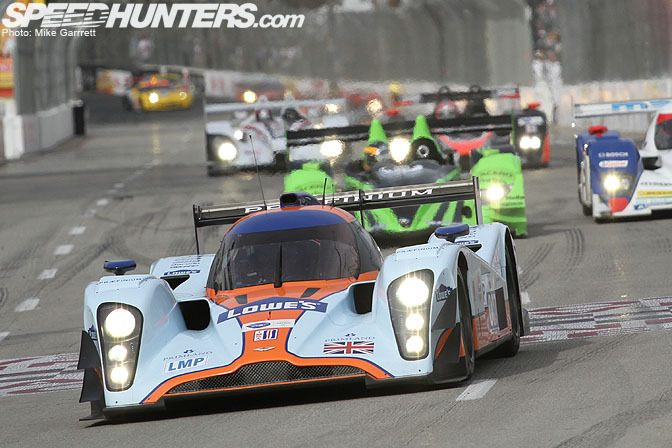 The battle between the Lola Aston Martin and the Acura was awesome. wow beautiful action shots. They're so damn clear. 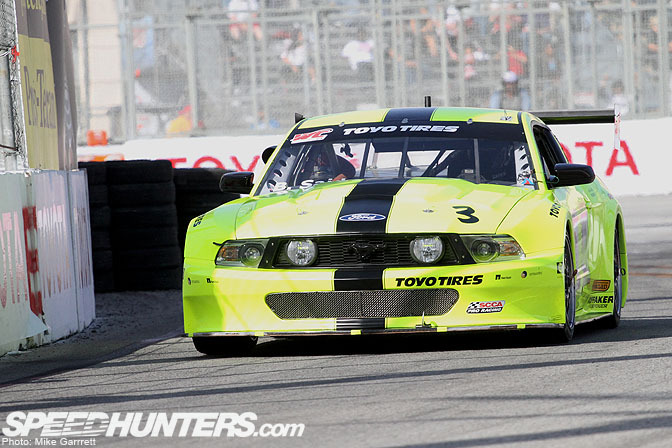 I wish I had the chance to be there, well at least I was fortunate enough to see Formula Drift last weekend. 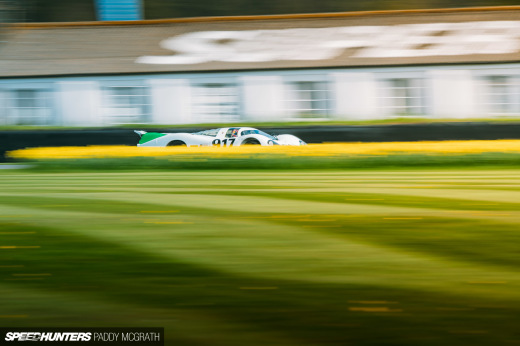 The Mustang looks like an old School Tranz-am Car ,Would love to see a couple of them down here in NZ with big motors , Racing against the Corvettes , Camaros , XKRs , Manaros & Rx7 in the NZGTR series .